I will be using the figure 8 method today. 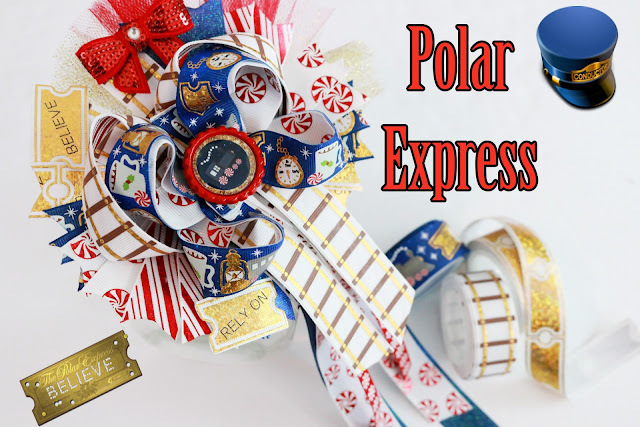 I am using 2 pieces of ribbon (Double layer) One ribbon will be seen on both sides. I want my Polar Express ribbon on the outside and the candy cane on the inside. Heat seal all ends before proceeding! I start at the top, form a loop which resembles an awareness ribbon. Bring this down to your clip (Middle) and secure under your clip or hold in place with your finger. Bring it toward you and press DOWN to the center. Turn your bow OVER to the other side. Adjust your loops and Crease the middle. You are now finished with your Twisted Boutique Bow! Now on to the Spikes! I am working with 12 strips today. Make sure that all of your strips are EVEN! I also run my lighter along the edges just to prevent any fraying while I am working on my spikes. Whatever you do, just make sure they are even with each other before you begin! Now take them and stack them together (one big stack) but make sure you layer the pieces with the match on top. Now you can fold them and put a straight pin in the middle to determine where the center is. Spread them all out again and make sure they are even then sew your middle up. If you are working with your woodburner like I normally do then you can go burn three holes in the middle and sew your embroidery floss in and out....PULL REALLY TIGHT when you get to the top for your crease. I will share this with you in an upcoming tutorial though. I am using two ribbons because they are one sided ribbons (I don't want the white back showing through). I fused the two pieces together with my Heat and Bond and they are NOT GOING ANYWHERE! I don't have to worry about them shifting or GLUE to dry. Now fold your ribbon in half. We need to know where the center is. Place an alligator clip right there in the middle to mark your CENTER. Not sure how wide to make the loop? I take my twisted boutique bow (TOPPER) and place it up to the surround a bow loop. Does it fit? GOOD That's how wide your loop should be then. Take another pinch clip and clip at the top. DO NOT GLUE your LOOP DOWN YET! Now go to the other side and do the exact same thing! Check the tails. Are they even? NO? Then pull up on your loop a little until they are even with each other. Ok before you glue your loops down we are going to add some more tails. I've gathered several ribbons in the same color/pattern scheme. Make sure as you are layering all of these "tails/streamers" that they are lining up with your original Surround a bow TAILS. Now once all of these have been added go ahead and GLUE your first loops down on top. Glue the spikes on top. Wrap or sew around each other. Attach your topper bow (Twisted Boutique) using the same method. 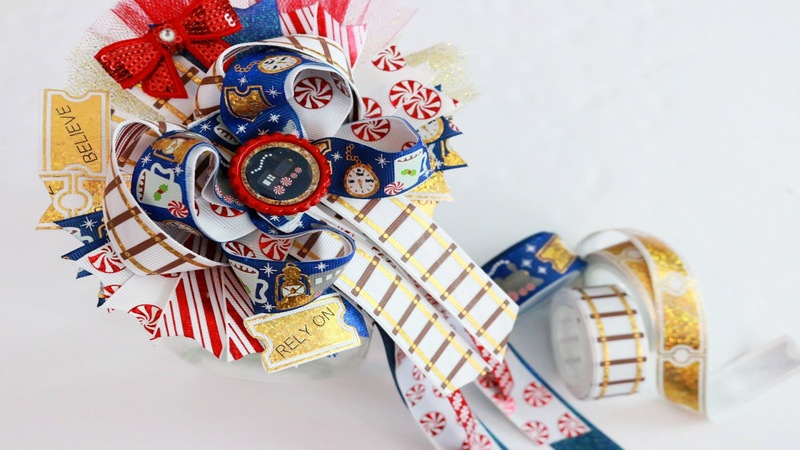 Now you can attach your bow to the hair clip and wrap the center with coordinating ribbon. For the finishing touches I added a bottlecap to the center, a red sequin bow was glued to the top and then I clipped a few "tickets" off of the ribbon and attached those to the spikes as well. Where did you get the peppermint and stripes ribbon? Do you have a list of measurements for all your bows? Hi linda congrats you earn it thank you for sharing all ur amazing bow tutorial I've learned so much from you ready for my craft fair thx to you.